Interstate Container’s innovative wax-alternative corrugated box, GREENCOAT®, draws attention at Dorchester–Düren Sister County Partnership event in Germany. Jim Krahn, Interstate Container Leader for Process and Product Innovation, and Pete Bugas, Interstate Container Cambridge General Manager, participated on behalf of the Dorchester County, Maryland Chamber of Commerce. The business expansion meeting explored opportunities for growth and opened doors to build awareness and compete internationally with GREENCOAT® environmentally-friendly corrugated packaging. GREENCOAT® a is recyclable, repulpable and compostable wax-replacement corrugated box for packing bulk poultry, meat, seafood, fresh produce, and floral packaging. Following the success of the meeting, Maryland-based Interstate Container Cambridge seeks to pursue further expansion opportunities for GREENCOAT® at the European Federation of Corrugated Board Manufacturers (FEFCO) meeting later this year. 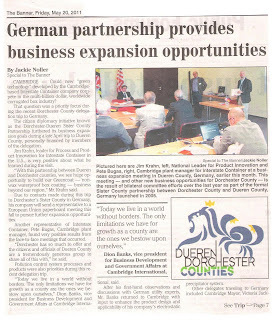 The bilateral committee for formal sister county partnership between Dorchester County, Maryland and Düren County, Germany was launched in 2005. Interstate Container is a division of Interstate Resources, a national group of kraft linerboard, recycled medium, and corrugated manufacturers based on the East Coast of the U.S.